Construction on the WTC site is already proceeding. No tower or other building (like the Transit Center) can really being until the below ground work is farther along. Hours after agreeing to collaborate on a 1,776-foot "Freedom Tower," architects Daniel Libeskind and David Childs posed at the World Trade Center site Wednesday and said they were eager to get to work. "It's going to be the best building in the world, and it's going to be a spectacular icon for New York and our re-emergence," said Childs, consulting partner of Skidmore, Owings &amp; Merrill. The collaboration announced earlier Wednesday gives Childs, who has done extensive work with trade center leaseholder Larry Silverstein, the lead role in developing the tower, which is to be the world's tallest. It remains unclear what effect the deal will have on Libeskind's design for the tower, which was part of a proposal for the site chosen over eight others. Asked whether he was concerned that his design would be compromised, Libeskind said, "No, absolutely not. It's going to be a collaboration, it's going to be something really dramatic, and it's going to restore the skyline of New York." Officials said that Childs would serve as the design architect and project manager leading the team that will design the tower. Libeskind will serve as a contributing architect for the concept and schematic design of the tower, they said. Lower Manhattan Development Corp. President Kevin Rampe said in a statement that the Freedom Tower would be designed in "a manner consistent with the Libeskind vision." The announcement followed a nearly eight-hour private meeting Tuesday night at the downtown offices of the development corporation, which was created after Sept. 11, 2001, to oversee the rebuilding process. Wednesday's announcement did not touch on any other aspects of the Libeskind plan, though Silverstein has voiced concerns about the commercial viability of the design. Also on Wednesday, a spokeswoman for Libeskind confirmed a published report that he passed the national architecture licensing exam last week. Libeskind holds several professional licenses overseas but took the exam to fulfill one of the requirements for becoming a registered, licensed architect in New York state. Daniel Liebskind, center, jokes it up with Larry Silverstein, right, at a news conference at Ground Zero on Wednesday. Liebskind and Silverstein announced that they have come to an agreement regarding the rebuilding of the World Trade Center. 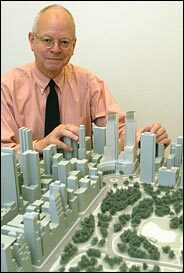 Larry looks thrilled to be presiding over conception of the greatest skyscraper ever. *Lets hope Childs and Libeskind push for all they can get. *This is THE project to really do something stunning. I was thinking the same thing. But the correct term is little person. This is a cuter shot of the lil' guy. I can't really comment on that picture. But we need many more people in NY who think large and grand and perhaps futuristic, with an eye on enhancing the city's image and economy. Clearly the men in that picture aren't among them. July 17, 2003 -- The two world-class architects who shook hands yesterday over plans to design the world's tallest building at Ground Zero now have to face the hard part - figuring out a way to reconcile their clashing visions for the site's iconic tower. "I think that what they can do is take elements from each design and use them," said Ed Hayes, a lawyer for Ground Zero master planner Daniel Libeskind. "They're two very talented people who have agreed to collaborate. They'll find a solution." After marathon negotiations that lasted from Tuesday night into the wee hours of yesterday morning, Libeskind agreed to work on the design of the 1,776-foot tall Freedom Tower, which is being led by David Childs, a prominent architect picked for the project by trade center developer Larry Silverstein. The agreement was hailed yesterday with handshakes and hugs at Ground Zero, but the smiles glossed over the hard work to come and details of the fragile collaboration still must be worked out. Childs and Libeskind are both considered world-class architects with big egos and little inclination to bend to the other's ideas. Libeskind's sketches have been widely circulated in his plans for the site. The building is made up of two parts, an angular 70-story office tower with a narrow spire and antennae stuck on its side, rising to 1,776 feet tall. Childs has kept his ideas under wraps, but he has worked on a concept in which the broadcast antennae and its base is perched directly atop the tower, not next to it. Childs has argued that Libeskind's tower would be difficult to make structurally sound and would add to the already considerable cost of the tower. The design deal brokered early yesterday calls for Childs, who has wide experience with skyscrapers, to be the lead designer. Libeskind, who has never built a tall building, is named as "collaborating architect." The plan calls for Libeskind to send a group of architects from his firm to work directly under Childs, who is a partner in the powerhouse firm of Skidmore Owings &amp; Merrill. Other details remained vague and development officials hope to bring the two architects back together tomorrow to work out the specifics. Childs has collaborated with other big name architects before, most notably Frank Gehry in a proposal for a New York Times tower. "There's no question that David's style and vocabulary are different from Daniel's," said a source. "But it's possible to speak in different architectural vocabularies and still work together." Ex- rivals David Childs (left) and Daniel Libeskind are all smiles at Ground Zero yesterday after their deal. Now you’ve done it—cemented a relationship to design the first tower on the former World Trade Center site. We saw the reluctant look in your eyes as you accepted the inevitable and embraced in the photo-op; we saw the wary resolve and the lingering questions of what lay ahead for you both. We could tell it in your smiles: A forced marriage is never an easy one. You both will face skepticism, including cynicism from architects and the general public, that the dynamic forged in the original selection process has been subverted. Remember what has already happened: the hours of agonizing conceptual design, the hundreds of thousands of dollars spent by the LMDC and other teams of architects, the white-hot glare of the klieg lights focused on a choice. This choice. Despite the gaffes along the way, and the public repudiation of interim plans, Libeskind’s plan emerged relatively unscathed. With good reason. Daniel Libeskind captured something beyond mere building in his drawings. His first plans, presented at the Winter Garden in December 2002, caught the moment with a vertiginous edge, presenting a gritty, angular view of today’s New York. Those first renderings, looming up from the Manhattan schist to asymmetrical high-rises, said something authentic about the people and the place with a dizzy energy. We recognized ourselves in those plans; you got it right. Outside pressure and events have already affected the outcome. No one can deny that the PATH station had to return to service, but subsequent requirements have reduced the plaza’s depth from approximately 70 to 30 feet; the Gardens of the World, which originally seemed more conceptual than actual, evolved into an open tower. Further changes will be inevitable and may prove beneficial as the plans mature. However, any decisions that smack of expediency and threaten to compromise the force of the original must be rejected. That advice goes for the whole team, for your client, and for each of you individually. David Childs, you have engaged complex programs before, though never with this critical attention. The stewardship of such a prime site, if managed properly, can gain you immeasurable international admiration, orchestrating the Libeskind scheme through the rough days ahead. Cave in too quickly, allowing this site to become a commodified real estate deal, or lend too heavy a hand to work that has already lodged in the public consciousness, and you will have failed in all our eyes. If you keep the Libeskind vision intact—not allowing the client or political wrangling to blunt the edges—you may find greatness within your grasp. Daniel Libeskind, do not surrender or weaken the ideas you have already forged. When you have presented your intentions for New York and the WTC site, those present have risen to their feet and applauded. You’ve been forced into a compromise marriage; keep December’s triumph in mind as you proceed through the coming months. Both of you will be tested. Your client, the developer Larry Silverstein, controls the purse strings. The Port Authority, a relentlessly pragmatic institution, owns the land. The Governor of the State of New York holds the political cards. But make no mistake. Ultimately, your client is the public, bound to this place and this process by an ethical trust that you both share. All of your fellow architects support you in your work as you begin the translation of a strong idea from two to three dimensions. Here’s your charge from all of us: Make it sing. I can only hope that they read this and take it to heart. Yawn...It's getting late here, but I thought I should comment. A couple of minutes ago I just walked into my apartment after my 3 1/2 week trip through Australia and New Zealand. I've been up for more then 35 hours! But, coming home, I was excited to see this. Something is happening. And that's good news. It's really starting to happen. I really want to see what this new design will look like! Good Luck to this project, and the bright future of Lower Manhattan. You know what's odd? The original WTC was designed by a man afraid of heights. The new one is designed by a short man. Both will be WTB when they're done. (If we get ours done before South Korea). I don't know, I just found that kinda funny. DAVID M. CHILDS, who in conversation gives the impression of a gentlemanly, corporate architect, is remaking the face of New York. He is designing the key building at ground zero, the so-called Freedom Tower. But as a partner and the lead designer at Skidmore, Owings &amp; Merrill, one of the country's largest architectural concerns, Mr. Childs is also responsible for three more of the city's high-profile projects. There's the nearly complete AOL Time Warner complex at Columbus Circle, which some call a new gateway to the West Side, and the universally applauded but temporarily stalled plan to recast the Beaux Arts main post office into a new and better Penn Station. He has also designed a new building for the New York Stock Exchange, a project that was postponed after Sept. 11. Other Manhattan buildings to Mr. Childs's credit include the Bertelsmann Tower in Times Square and Worldwide Plaza on Eighth Avenue. Mr. Childs has also managed to be controversial, and handles even the nastiest insults with unassailable cheer. "Oh yes, I was a pariah for a time," he said brightly, as if describing a Halloween costume that really did the trick. His supposed sin was to say, in the weeks after Sept. 11, that he was ready to rebuild at the World Trade Center site at a time when many others were still too stunned to ponder the future. He received so many hate messages he changed his cell phone number. "But people came around," Mr. Childs said in an interview at his Wall Street office, overlooking a sun-soaked ground zero site already busy with new construction crews. Nor has he dawdled. His replacement for 7 World Trade Center — a 740-foot transparent glass box with a light-deflecting, wedged shape — is on its way up. Mr. Childs is also proceeding with the design for the so-called Freedom Tower, sketched in by Daniel Libeskind, the master plan architect for rebuilding at ground zero. Mr. Libeskind proposed the location and height of the tower — at 1,776 symbolic feet, it will be the world's tallest tower. But Mr. Childs and his firm — as the architects for the developer Larry A. Silverstein, who has the lease to the site — will deliver the actual design. Unlike Mr. Libeskind, whose egghead chic has inspired a New Yorker cartoon, Mr. Childs, even at 6-foot-3, can easily pass unrecognized. Buildings as "egoistic big statements," as Mr. Childs put it, do not interest him. Making the fabric of the city is what excites him most: how streets thread their way through avenues and parks, how they open vistas to rivers or create a neighborhood. If his buildings sometimes tend to be over-polite, if not bland, that too is intentional, he says. "David is a different model from the big-name architect with an agenda," said Wendy Joseph, president of the Architectural League of New York. "He's one of the few who sees himself in a broader way as a statesman and a leader." The cordial Mr. Childs manages to maneuver through highly charged projects that ruin the reputations of other talented architects. He has made himself the darling of developers like Mr. Silverstein (which has made Mr. Childs a target of others less enamored of them), and while aesthetically conservative, remains close friends with avant-garde architects, including Peter Eisenman. He has also managed to construct for himself a benign, neutral presence in the media. "People are terrified" of criticizing Mr. Childs, said Robert A. M. Stern, the dean of the Yale School of Architecture. "They don't want to hurt his feelings." Mr. Childs came of age professionally in Washington. After graduating in 1967 from what was then called the Yale School of Art and Architecture, he joined Nathaniel Owings, a founder of Skidmore, Owings &amp; Merrill, and Daniel Patrick Moynihan, then urban affairs adviser in Richard Nixon's White House, in preparing a master plan for the Washington Mall and redesigning the capital's grand ceremonial boulevard, Pennsylvania Avenue. President Ford then appointed Mr. Childs chairman of the National Capital Planning Commission. "He was the fair-haired boy of Nathaniel Owings," Mr. Stern said. "His career in savvy politics goes way back." In 1984, Mr. Childs moved to New York City, charged with reviving Skidmore's flagging image. In its heyday in the 1960's and 70's, the gigantic firm (it still has 350 employees in Manhattan, plus branch offices in London, Washington, San Francisco and Chicago) was masterful at rendering American thumbs-up opportunism into slick, muscular corporate offices like the Sears Tower in Chicago. But by the 1980's, the firm was churning out boring buildings that were still very large, but also generic. Mr. Childs came to Manhattan when the real action, design-wise, was in the architecture schools and in the minds of a few theoretical impresarios who preferred paper architecture to the messy reality of construction. Soon after Mr. Childs arrived, Philip Johnson smoothed the young architect's way by inviting him out to lunch. He was also invited by Mr. Eisenman to the monthly dinner at the Century Association, a private club in Manhattan, attended by some of the leading lights in the profession, among them Richard Meier, Frank Gehry, Charles Gwathmey and Michael Graves. "I proposed to bring him into the Century circle for no reason other than he was a bright young guy we needed to have," Mr. Eisenman said. "Some in our crowd were not so happy that I did it, but they were wrong." Mr. Childs had early success in the churning and competitive world of landing New York design commissions. He wasn't trying to reinvent the box or provoke any fierce reactions with his polite designs, and soon he was building the Worldwide Plaza office complex on Eighth Avenue. Mr. Childs describes his favorite kind of work as the kind of commission many famous architects won't touch. "I like big complicated projects where you have to assemble teams, deal with the down-and-dirty contractors, the marketplace and the leasing agents with an imagination level only as high as what made money last time," he said, sounding for a moment like Gypsy Rose Lee on the subject of greasepaint. "For me, that's really building in the city." Mr. Childs enjoys the fray. Transforming Columbus Circle couldn't have been a messier process, dragging on for some 20 years. Through it all Mr. Childs sat tight, weathering turnover in developers, mayors, tenants and even public taste in order to see his double-towered complex — a new home for a new AOL Time Warner — finally cast its huge shadow across the edge of Central Park. 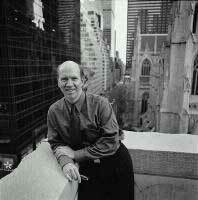 It was as much chance as doggedness that led Mr. Childs to the World Trade Center. He met Mr. Silverstein, who leased the twin towers months before they were destroyed, by attending a 1984 series of lectures on real estate that the developer gave at New York University. They stayed in touch over the years, Mr. Childs said. But it wasn't until August 2001, a month before the planes hit the towers, that Mr. Silverstein approached him about renovating his new properties. Mr. Childs and his team started working on a few preliminary ideas for improving the buildings' lobbies and the plaza. "I really disliked the whole complex," Mr. Childs said, describing the elevated platform on which the towers stood as "fortress-like and alienating." It was, he said, "a place I went out of my way to avoid." He was scheduled to present his ideas to Mr. Silverstein on Sept. 12, in a conference room at the World Trade Center. On the 11th, in fact, Skidmore had more than a dozen employees in the towers, mostly interior designers working with one of the brokerage houses. One Skidmore employee died. On Sept. 13, Mr. Silverstein and Mr. Childs met to discuss what to do next, and how, Mr. Childs said, "to come back up again and recreate the skyline." "David is the quintessential professional," Mr. Silverstein said in a phone interview. "He possesses the flexibility to adapt to different needs, agendas and pressures." By habit and personality, Mr. Silverstein said, Mr. Childs is "willing to subordinate himself to accomplish the goal." Mr. Childs's choice of diplomacy over art has paid off for him and his firm, and he now has dozens of Manhattan buildings to his name. "David Childs is not about inventing a new architecture," said Ms. Joseph of the Architectural League. "People don't expect that from him. He's not taking a lot of chances, but he can make a building happen." But what kind of building? Mr. Childs's corporate equanimity leads some architects to worry that what gets built at the World Trade Center site won't live up to expectations. Robert Ivy, editor in chief of Architectural Record, a professional magazine, is so concerned that he printed an open letter on the cover of the September issue, pleading with Mr. Childs and Mr. Silverstein to allow Mr. Libeskind to take the lead in the design. "While I know David Childs is capable of making a competent building for the site, Daniel Libeskind's plan had a vertiginous, dizzying quality that captured something of New York and it would be a shame to lose that," Mr. Ivy said in a telephone interview. Mr. Childs expects to show a final design to Gov. George E. Pataki in September. Both Mr. Libeskind and Mr. Childs have their own kind of tenacity. Mr. Libeskind moved to Berlin for a decade to make sure that his design for the Jewish Museum there wouldn't be sidelined by politics. Mr. Childs has displayed his own staying power. He has made himself the darling of developers like Mr. Silverstein (which has made Mr. Childs a target of others less enamored of them), and while aesthetically conservative, remains close friends with avant-garde architects, including Peter Eisenman. He's a puppet, simply stated. A businessman. The article tries to make that a positive thing. I'll be looking forward to it but I think that it will be simply impossible for it not to look a lot like what Libeskind has already proposed. If Childs stays true to form as someone who wants to actually get things built then he'll stick with the original design. Its too engrained in the public's conciousness to be drastically changed. I just hope he doesn't bland it down. I am expecting a very dazzling rendering with lots of light effects that will be totally unrealistic though. I suspect most people will fall for the pretty picture and say its soooo much better.